Due to the fact that Ancient Celts had an oral tradition, Celtic Literature was a little thin on the ground until the time that Christian Monks began to transcribe the myths and legends. Much of the myths have their beginnings in Pre-History, some have been linked to Indo-European models and motiffs. 2- The Druids feared that it would loosen their monopoly if others could read of their knowledge at will. Whatever the reason we are left today with only part of what must once have existed. The Book of Leinster, which dates to around the 11th or 12th Century, contains a list of tales that are now lost to us. What we are left with is therefore all the more precious. The Mythological Cycle as the name implies tells of the Pagan Celtic Deities and the forming of the world of men. One of the main tales is Cath Maige Tuired (The Battle of Moytura) which tells how the Tuatha de Danann overcame the their enemies, the Fomoiri. The cycle details the coming of the Tuatha de Danann to Ireland and how places gained their names, the battle against the Fir Bolg and the coming of Lugh. This group also contains Aislinge Oenguso (The Dream of Oengus) and Tochmarc Etaine (The Wooing of Etain). The Ulster Cycle tells of the exploits of the warrior-caste the `Red Branch`, particularly the hero Cuchulainn. The main tale is Tain Bo Cuailgne (The Cattle Raid of Cooley). The myths themselves began to take shape before the second century CE, though it was not until the eleventh that they were written down. Tradition states that the reign of Conchobhar mac Nessa began in 30 BCE and ended in 33 CE (allowing some over enthusiastic monk to suggest that he died of a broken heart on hearing of the passion of Christ), and the short career of Cuchulainn takes place entirely within his reign. The Fenian Cycle deals with the adventures of Finn mac Cumaill and the myths that built up around his exploits and those of his warrior band, the Fianna. The historical dates that form a backdrop to these tales take place between the Battle of Cnucha (174 CE) to the Battle of Gabhra (283 CE). It is highly probable that some of the tales that make up this cycle are of a more ancient pedigree and were grafted onto the tales of Finn. The Historical Cycle deals with `historical` figures, particularly Kings said to rule between the Third and Eighth Centuries CE. Several books compiled during the early Middle Ages provide us with additional information regarding the characters and the events of the four cycles. The Dindsenchas tells of the lore pertaining to geographical features in Ireland. Lebor Gabala Erenn (The Book of the Taking of Ireland) is a `history` of the peoples who have invaded Ireland, of Cessair, Partholon, Nemed, the Fir Bolg and the Tuatha de Danann. The Mabinogion is a medieval collection of Welsh tales. 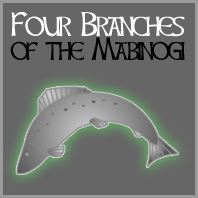 There are four tales refered to as the Four Branches - Pwyll pendefig Dyfed (Pwyll prince of Dyfed), Branwen ferch Llyr (Branwen daughter of Llyr), Manawydan fab Llyr (Manawydan son of Llyr), Math fab Mathonwy (Math son of Mathonwy), plus seven other tales such as `Culhwch and Olwen`. The Arthurian Cycle evolved from tales in the Mabinogion, which it later superseded due to its popularity in Medieval Europe. Though much of it was written in non-Celtic lands, it clearly draws upon Celtic literature containing as it does many Celtic themes. Though it clearly has a strong Christian element, the Grail has its beginnings in the Celtic tales of a sacred Cauldron. In The Sack of Annwyn from the Book of Taliesin, Arthur attempts to seize the magic cauldron, and in doing so he loses all but seven of his men. The Mabinogion, and much of the Arthurian legends (though much of the later versions have been added to by other cultures - French, German, Italian and Spanish, they still maintain their Celtic roots) contain many Brythonic Deities, often hidden in the tales as half-human/half divine Kings and other characters. Poetry attributed to Taliesin and Aneirin, and the countless unnamed bards who kept the tradition alive, captures a host of human emotions and the intense love of nature which is descibed in incredible detail. Both Llywarch Hen (Old Llywarch) and the Heledd Cycle deal with the grief of a single survivor of one of the battles with the encroaching Anglo-Saxons. The battles also feature in the poems about Urien Rheged and the Armes Prydein. The metre used is the englyn (either the `englyn milwr` with three lines of equal length or the more complex englyn penfyr with a long first line and short second.) I won`t try to explain about Cynghanedd and Welsh poetic forms, I`ll leave that for another day. What I will say is that Welsh poetry has a different `feel` than that of English, the rhythm and rhyme are emphasized in a different way, in some there is almost a mantric feel. The epic sixth century Y Gododdin also deals with one of the battles in the Old North, the tale of the struggle between Y Gogledd (the Men of the North) and the invading Angles. After the Norman invasion, the power of the bard diminished, the praise-singers began to lose their place in the halls of Kings, banned by the Norman overlords. But the songs would survive, the Welsh Princes began `competitions` and festivals, and thus began the Eisteddfod. The troubadors and poets of Medieval Europe were influenced, with tales like `Tristrum and Isuelt` and `Peredur` told in France, Spain, Italy and Germany. The works of Dafydd ap Gwilym (famous for his `love` poems), Einion Offeiriad and Dafydd Ddu Athro are considered the zenith of Welsh poetry. Literature, and especially poetry are still very important within the Celtic speaking world, just take yourself off to the Eisteddfod. Sadly, few people realise that there is a modern Celtic literature been created by a modern Celtic culture. The non-Celtic world world has sought inspiration from Celtic Literature. Films such as DragonHeart, First Knight, Excalibur and Highlander try to capture the `feel` of the Celtic mythos, though obviously `Hollywood` influences are more to the fore. Though influenced as much by Germanic myths, there is still a very strong Celtic element in the works of JRR Tolkien, David Eddings, and much of modern `Fantasy` books. D&D has also drunk deep from the well of Celtic lore. Modern interpretations and re-writings of the myths continue a tradition of the telling of these tales that often have their beginnings in the mists of pre-history. Morgan Llywelyn`s `On Raven`s Wing` is a modern telling of the Tain Bo Cuailgne and of Cuchulainn. In `The Mists of Avalon` Marion Zimmer Bradley reworks the Arthurian myths. Stephen Lawhead has also reworked the Arthurian tales with `Uther`, `Arthur` and `Merlin`, and gives a detailed interpretation of life in the Celtic British North in his `Song of Albion` Trilogy. Few myths can be said to have spread as wide and influenced as much as the Arthurian Legends.